Buick Rainier was first created as a replacement to the phased out Oldsmobile series of SUVs. The year was 2003 and Buick entered the SUV world with the Rainier. Initial sales were strong because the Rainier was powered by the 4.2L and 5.3L Vortec V8 engine. This engine is significant because it is GM’s flagship engine. The Rainier transfer case is designed to work in conjunction with this engine. We have a stock of Buick Rainier transfer cases that are either rebuilt or used. We give our customers the option of choosing the type of transfer case that is right for replacement in their Buick Rainier. There are professionals selling online and then there are those that are not. We’ve invested into our company to make selling transfer cases the best it can be. It takes a lot of money to buy testing equipment and machinery used to rebuild transfer cases for sale. We choose to offer the Buick line of drive train components not because we can. We do it strictly because we know there is a customer demand here for a great product. 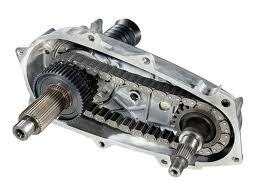 There are few places outside of a GM dealership where you can find a suitable transfer case. We’re one of the best places to find what you need. The Vortec engine is a complex piece of GM machinery. It was designed to give a lot of horsepower and torque to all that use it. It was no secret that GM needed the Vortec to supply the power in something as big as the Buick Rainier SUV. The rebuilt cases that are sold from our website and our shop work with the Vortec engines. These are built according to what GM requites. There are some sellers that either rebuild or purchase from rebuilders that try to modify the OEM design. You’ll never find that quality of work here. What you get when you pay us the money for a transfer case is one that is an exactl replica of a true GM one. Our used transfer cases for sale offer you a lot of value too. You don’t have to rely on remanufactured units to get a great deal. There is a difference between the two but they are small. The remanufactured ones get new couplers, bearings and other important essentials replaced. The used units are cleaned and given a spin test for accuracy. We check the Buick transfer case fluid and we measure the performance of each gear. Even for a used case you get a great buy. We believe in customer service and want customers to feel their money is well spent. Quotes start off here with a quick toll free phone call. Our number is (888)-508-7153 . We work to get you a quote rapidly and will always answer you questions. We know everything to know about the Rainier and can help you identify what you need here. Our online quote system is just as fast. You only need to select your model and year from the customized form. What you are shown on the next page is our lowest transfer case pricing.